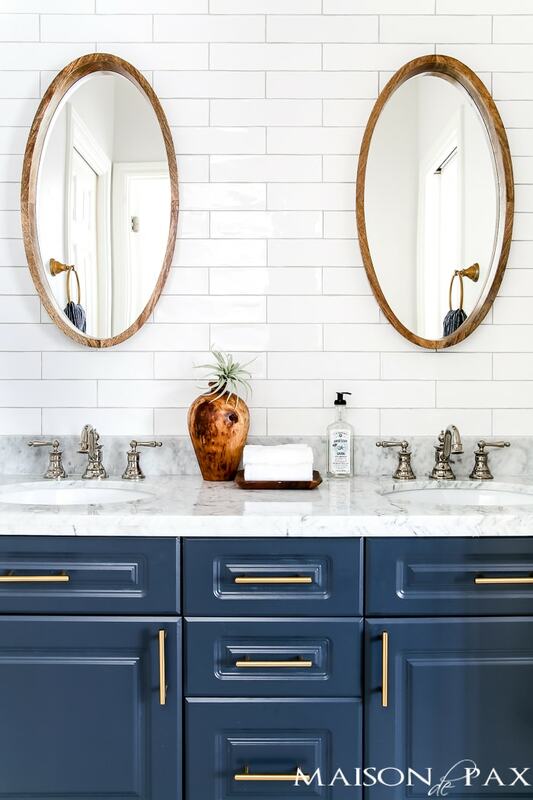 This navy and white bathroom with marble and brass accents is gorgeous and functional. 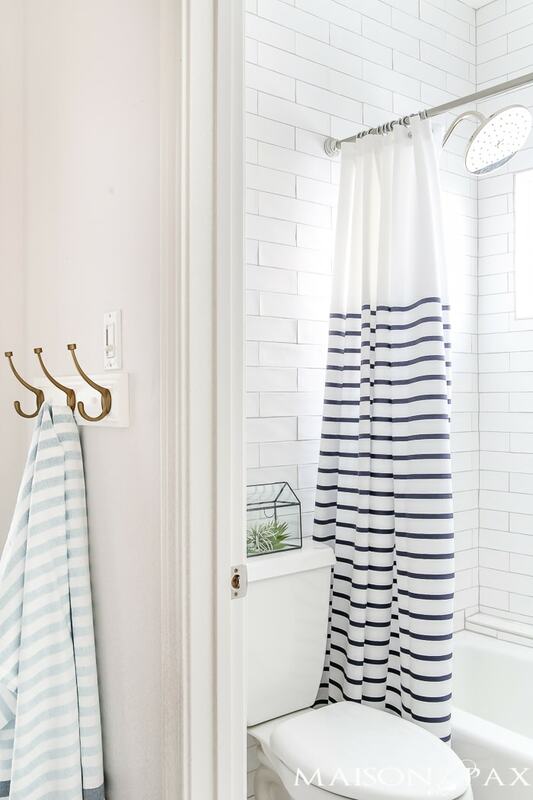 Find out great sources for bathroom remodels to complete a renovation like this and tips on when to splurge and when to save! I expect to get questions from time to time on sources, but you guys are giving me an extra part-time job with questions on this bathroom! 😉 So I want to put it all in one place for you. As with most of my projects, it was a combo of some save items and some splurge items. 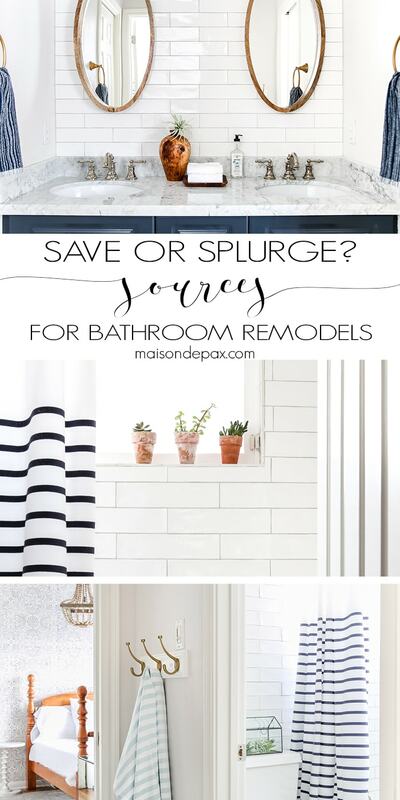 I love searching for that balance… So there is a simple source list at the bottom as well as shop-able images, but first I want to share a few save/splurge ideas with you. We used this tumbled marble hex tile on the floor and this marble countertop. While both are actually quite affordable as far as real stone goes, they are certainly more than some other options… but they stay in the space for years and increase the value of your home. 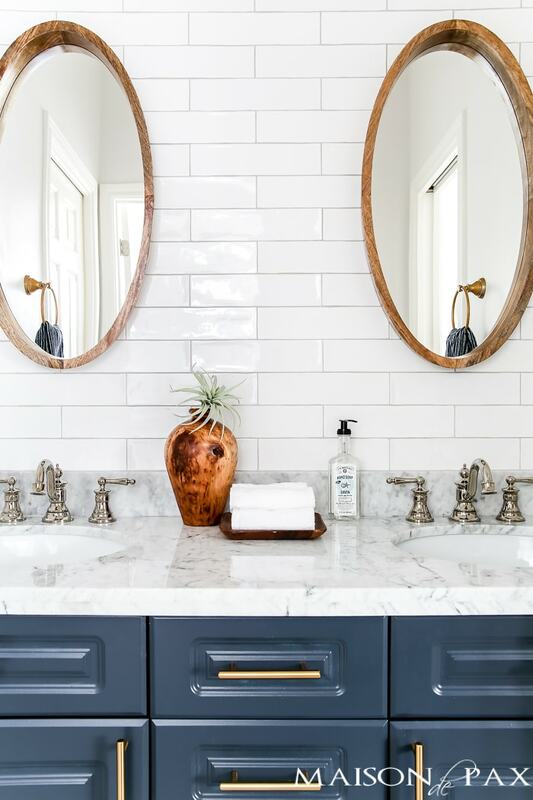 Like the stone, faucets are permanent fixtures in the space, so they increase the longevity of your remodel as well as the value of your home. If you’ve got room in the budget, splurge here! 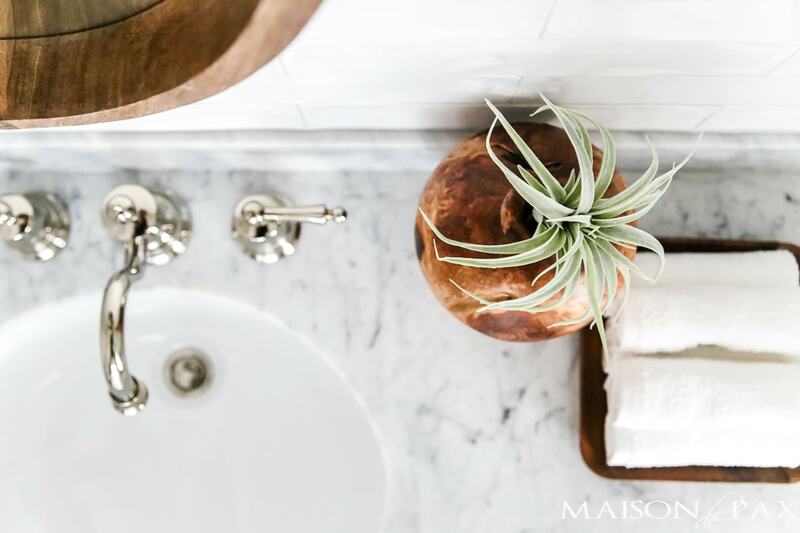 These polished nickel sink faucets and this shower/tub combo kit were generously provided by my friends at Moen, and they increase the sophistication level of the room by several notches. If you are a power DIY-er, then you can “splurge” by investing time. If you’re 9 months pregnant with baby #4 like I was (ha! ), you can splurge by hiring it out. Either way, a little extra effort/money to tile the full water closet and the wall above the vanity with this white tile was totally worth it. We used the most basic white undermount porcelain sink that my countertop fabricator provided. Basic, unobtrusive, and inexpensive. The vanity in this space is not expensive. It is simply the white laminate builder-grade cabinet that was in the bathroom before, but with a good paint job in Polo Blue by Benjamin Moore (tutorial coming soon!) and new brass hardware, it looks like a designer piece. Notice I don’t have any! Towel bars can be so expensive. I simply used Rub ‘n Buff to make the brushed nickel towel rings we already had match the cabinet pulls and added this affordable set of hooks to the wall for big towels. We kept the basic tub and toilet in this space. Nothing of unusual size would have fit anyway (if you do have space, a beautiful tub might need to switch to the splurge category! 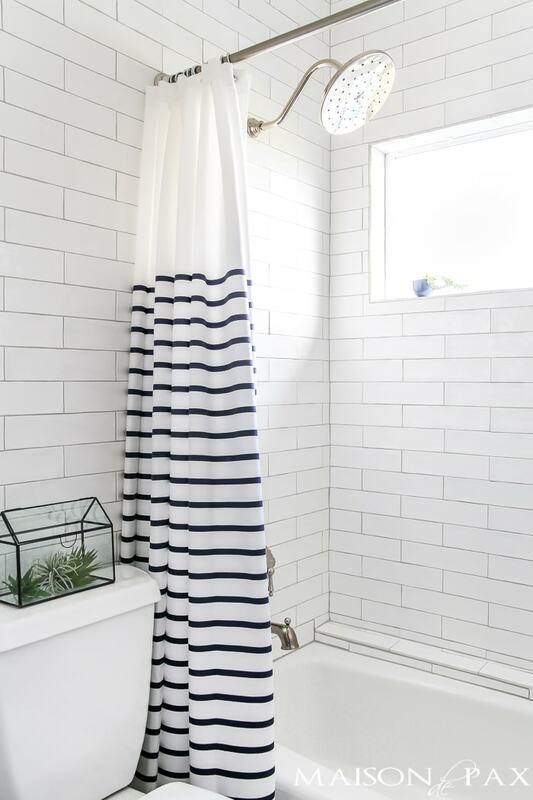 ), but with the full wall white tile and this fabulous shower curtain, the basic fixtures blend in perfectly. 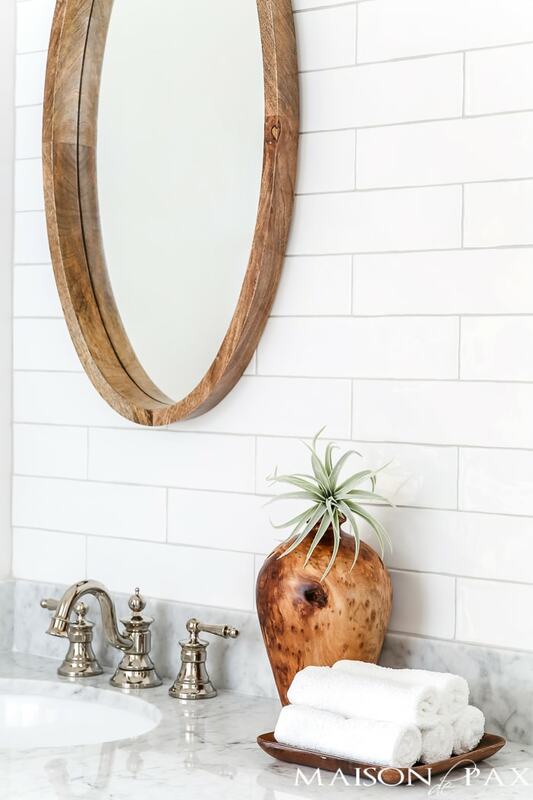 I am in love with these wood frame mirrors we found. 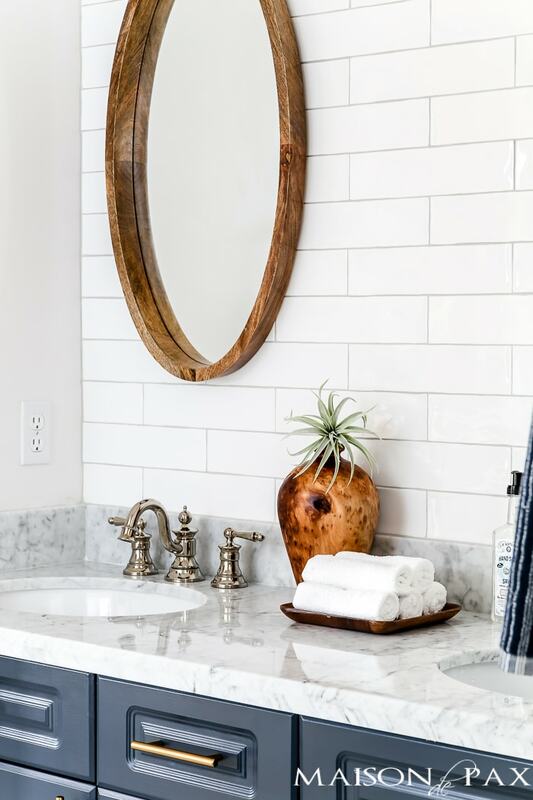 But even if you need a different look for your space, there are numerous affordable options for bathroom mirrors. 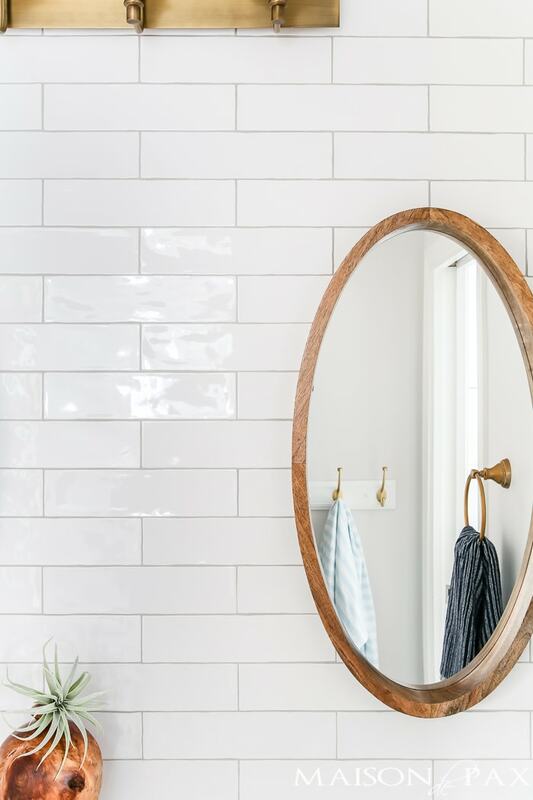 Homegoods, Overstock, and other discount stores offer big, beautiful wall mirrors at affordable prices… Usually much less expensive than actual “bathroom” mirrors. I love how you mixed your metals. I’m going to keep that in mind when I remodel my master bath later this year. Thanks for sharing your sources. Sandra, I am so glad it was helpful! Never thought of using Rub ‘n Buff, may be a good choice for updating my powder room, certainly worth trying. How does it hold up on the towel ring? I think it holds up really well! Give it a try! Rachael, I noticed you have a window in your shower. I am wondering what you used for a window covering there. Hi Kathy, the shower originally had wooden shutters, but we removed them for the remodel and decided not to replace them. The window is well above shoulder height, this room is on the second floor, and we live up on a hill, so there’s no danger of anyone being able to see in. 😉 In a previous home, though, we had a larger window and we used fake wood 2″ blinds. Since they were made of plastic, they felt safer to be near so much moisture, but they had a look of real wood. The other option would be trying to frost the window, but I guess that wouldn’t help protect your wooden frame. I also might consider just giving the wood a really good coat of oil based or even exterior paint to protect it from water. Those are just off the top of my head! I hope this helps in some way! Thanks for your reply, Rachael. I have no worries now about privacy with the smaller window we had put in. A good coat of oil based paint is a very good idea. Thanks for your suggestions. Scott- so glad you found it inspiring! Thanks for stopping by! My husband and I have been planning a bathroom remodel, but we don’t know what kind of items we should spend most of our budget on. Thank you for listing things we should splurge on and things we should save on. 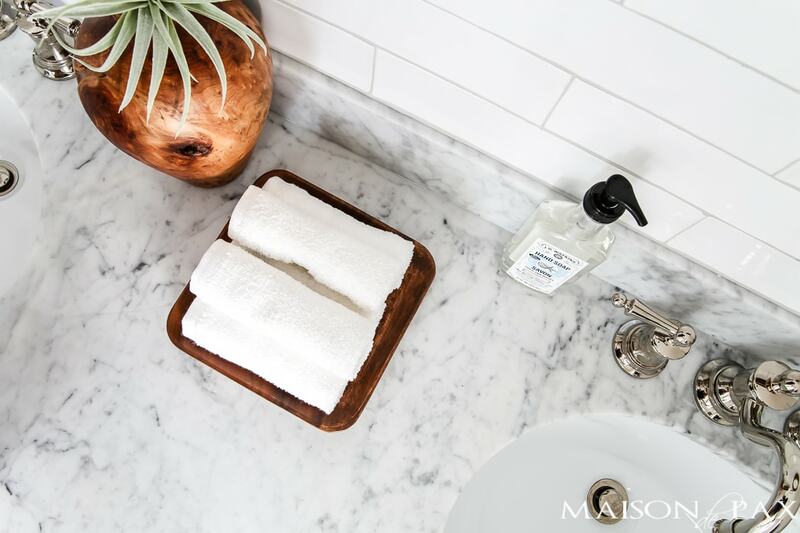 We didn’t think about splurging and getting a real stone countertop in the bathroom. That is nice, it can add value to our home. Deb, I am so glad it as helpful. It’s always nice to learn from others’ experiences too! Thanks for such a nice kitchen tip. I really need this, as we are currently building a new kitchen so it will really going to help me and my team. Of course! I am so glad it was helpful. Thanks for the all great ideas. I am so glad it was helpful. I am looking forwarded to my new bathroom. Quick question: did you have your tub refinished? We are remodeling a 1969 bathroom and the cast iron tub is in great shape, but might look dingy once we surround it in bright white subway tiles. I’m trying to decide between refinishing it or replacing it with something deeper (maybe the tub you used in the marble and subway tile master bath, but that one is drop in and the current one has an apron…so the new tub would require more DIY work and materials, but be a lovely depth…just not sure if new tubs are as well made/hold heat like the old cast iron). This is for one of our teenage boys. He’d really rather a shower, but we think there should be one more tub besides the master tub so we’ll either do a curtain or a glass panel on his tub/shower combo. Sorry to ramble!! Great question! We did not have the tub refinished as it was in excellent condition. I think it was from the early 90’s. I’m sorry I don’t have more info for you there! I’m told the cast iron ones hold heat better than the new tubs, but I’ve never had one of each at the same time to compare. Ha! Good luck on your remodel!! Recently my husband and I are planned to remodeling our master bathroom. So I am glad I find your article I like your basic bathtub and toilet space idea and also the decoration was great. Thanks for sharing this.